What a pleasure it was to return to the lowcountry surrounding Charleston. It is a gentle and genteel place in this world….easy going, gracious, and beautiful. I enjoyed three days with multiple generations of friends in settings ranging from quiet, winding tree-lined roads of Mount Pleasant, to strawberry pickin’ at Boone Farm, to the good life of Wild Dunes on the beach, and to the plantations along the Ashley River Road. On my first morning I drove to see old (fauna) friends at the Audubon Swamp Garden adjacent to Magnolia Gardens. Civilization has arrived there in the form of an admission guard and a locked gate with a combination lock. I’m not going to give away the combination but Magnolia Plantation dates from 1676. 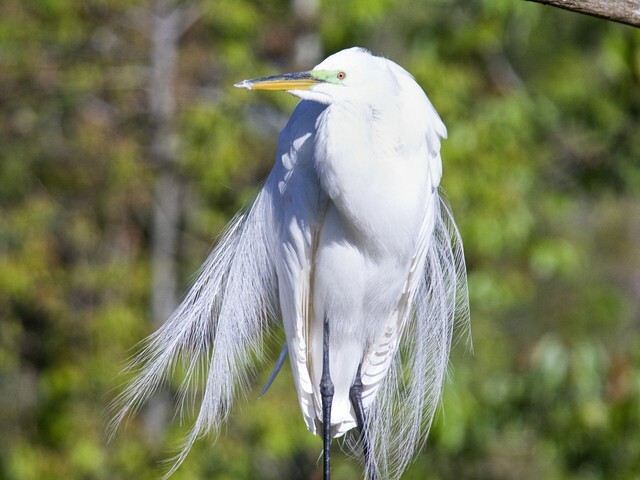 As seen below, the Great White Herons were in their breeding plumage. The feathery plumage is the standout feature but also characteristic is the green cast in front of their eyes, and the blackened bill top. 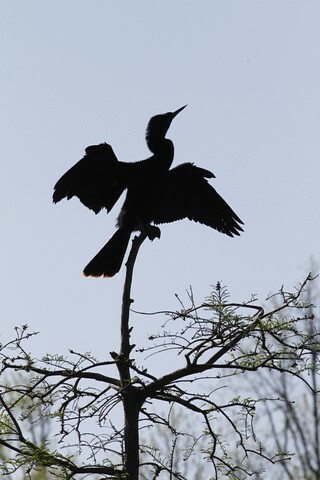 Elsewhere in the garden this anhinga, wings spread to dry, seemed poised for a lift-off to an earth orbit. My other big outing day was to the Middleton Plantation. 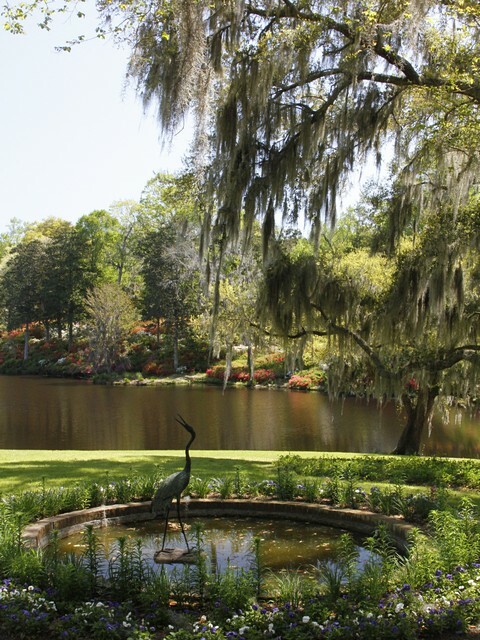 The panorama at the top of this post is of the Azalea Hillside above the Rice Mill Pond. I keep trying to capture this but I’ve never been there at the right light. So, another compromise but such a beautiful scene. Below is another view of the hillside, with one of the many sculptures on the grounds. There was an 18th century reenactors camp there for the weekend. Here are a couple of the kids taking time off from reenacting to just play and talk. This shot was suggested by my friend, Bob W., and it was a good idea. Here is a view at the aptly named Reflection Pool. Finally, having had a nice lunch with a glass of Chardonnay, I could relate to this fellow’s (in)activity. Looks like you had a great time Ralph. Thanks for sharing. These are beautiful Ralph. I hope to visit the town one day. Ralph you make me want to jump on an airplane and go to Charleston. These photos are lovely. Great job Ralph!!! Love the panorama a, the girls in the tree and the bird silhouette. Looks like it was warm too — something I am longing for. Thanks, folks. It’s my breakout from a relatively unproductive winter. 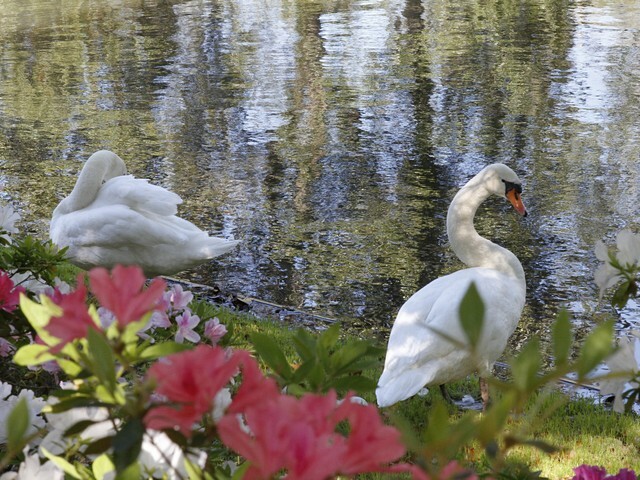 And, a perfect place to do it with the azaleas and dogwoods in bloom, and nap-inducing temperatures and breezes. As always, I enjoy not only your images, but your commentary as well. Nice images! It’s great that you have a bunch of friends who give you an excuse to go. (Do you go every year or what?) Also, I didn’t know there were alligators there. Thanks. The gator was not photoshopped or i-stocked in. 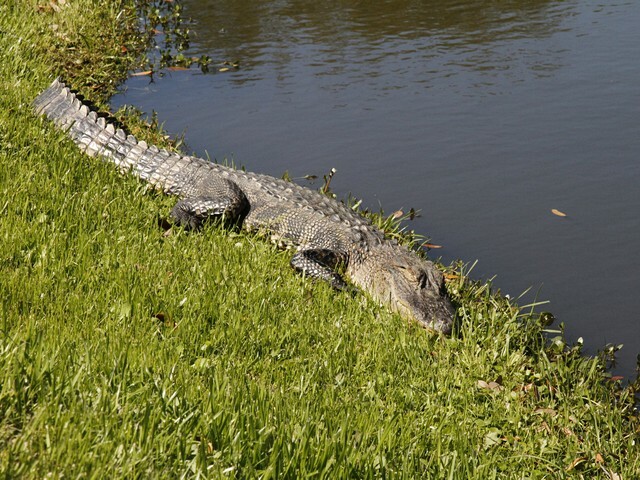 In the four times I’ve gone to Middleton there has always been a gator sunning on a pond bank. This one would lift an eyelid at the sound of my shutter. The focal length was 105mm so I was close enough to be anxious. There are three on this page from my March 2009 trip. Thanks for sharing-can feel the warmth of the spring breezes in these images.